A ban on feeding pigeons at the Republic Square has sparked public outrage after numerous birds died of apparent starvation. Several people have expressed strong disapproval on social media of the housing ministry’s decision to impose the ban last Wednesday (April 15). 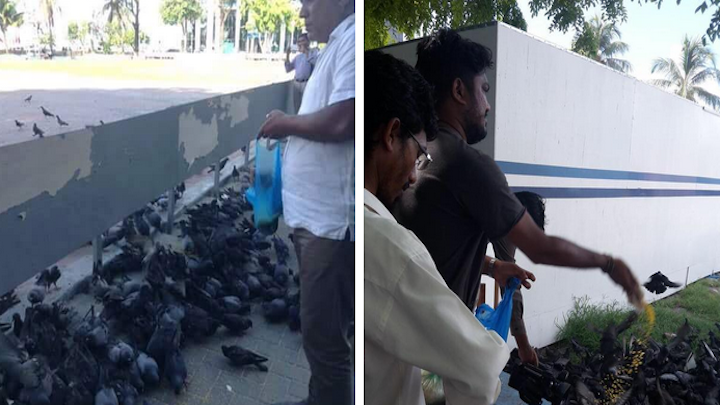 “Stop brutality against pigeons, Feed the pigeons,” tweeted one Maldivian. Hundreds of children and adults gather at the square every afternoon to feed raw rice to the pigeons. However, entry to the square has now been restricted by a fence and the housing ministry has erected boards prohibiting pigeon feeding. The housing ministry says feeding the pigeons causes damage to the grass, newly planted for an upcoming celebrations to mark the golden jubilee of independence. Nearby buildings also appeared dirty due to pigeon droppings, the ministry said. Local media reported yesterday that several starved pigeons pecked at tourists and passers-by. According to newspaper Haveeru, the pigeons are dependant on humans for food and some are now too weak to fly. Hundreds of pigeons stood on the fence while several more were crushed by vehicles while trying to cross the road. The article of haveeru on starving pigeons touched me so much just went to jumhooree maidhan with my daughter to feed the pigeons. “Arrest me for feeding the pigeons,” tweeted former environment minister Mohamed Aslam. Former footballer Ismail Zariyand also tweeted a picture of him feeding the pigeons in defiance of the ban. The square now remains empty except for a few starved and dead pigeons lying in the park’s corners. The ministry will provide “alternative/more ideal locations” for pigeon feeding, tweeted housing minister Dr Mohamed Muizzu on Thursday. However, the ministry is yet to announce the new location. The ban comes amid renovations of public spaces in the capital in preparation of the 50th anniversary celebrations, including repairing the water fountain at the square. Members of the Male’ City Council have offered solutions to “the nusiance and bother of expatriates [congregating] at the Republic Square” in the capital at a meeting last month. According to minutes of a meeting on June 28 published on the council’s new website, Deputy Mayor Ahmed Samah Rasheed noted that the issue had been discussed before and suggested contacting the Bangladeshi High Commission. “[Mid-Henveiru Councillor] Lufshan [Shakeeb] noted that foreigners at the Republic Square were damaging the grass in a number of ways and said that the area should be walled off with a tin fence and cleaned,” reads the minutes. Lufshan suggested working with the Maldives National Defence Force (MNDF) and police “to develop Republic Square.” Henveiru South Councillor “Rukuma” Mohamed Abdul Kareem backed the notion. The agenda states that the discussion was prompted by a letter received by the council. 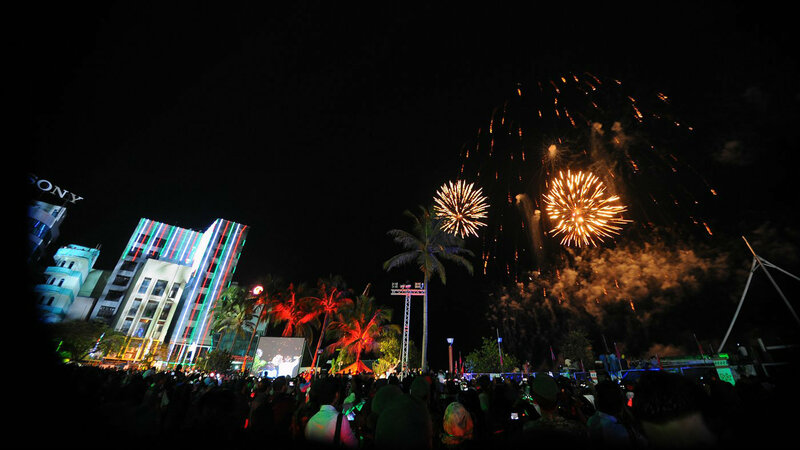 Machangoalhi South Councillor “Jambu” Hassan Afeef meanwhile claimed that expatriates were “committing indecent acts” behind the National Museum site and other open spaces in Sultan Park, recommending that the grounds be closed to the public. Mayor “Sarangu” Adam Manik however said that “any measures taken should be democratic,” which led Falah to suggest putting up notice boards at the Republic Square in languages used by expatriates to inform them that the area was out of bounds. The Mayor however favoured closing the square ahead of celebrations of Republic Day on November 11 instead of an abrupt closure and reopening with improved security to ensure there was no further loitering. Manik also noted that expatriates congregated in other open spaces in Male’ such as the artificial beach area. Following the discussions, the city council unanimously approved a motion to form a steering committee with officials from the army and police as well as the Tourism Ministry, Foreign Ministry and the Human Rights Commission. Lufshan, Afeef and Kareem were chosen to represent the council on the committee. All seven councillors in attendance at the meeting belong to the ruling Maldivian Democratic Party. Large numbers of expatriates living in Male’ use the Republic Square as a park, particularly Bangladeshi labourers on weekends. According to official figures, 1,600 Maldivian companies and 2,000 individuals between them employ 70,000 expatriates in the Maldives – a third of the country’s population – not including an unknown number of illegal migrant workers. Meanwhile, an ongoing police investigation into labour trafficking uncovered an industry worth an estimated US$123 million, eclipsing fishing (US$46 million in 2007) as the second greatest contributor of foreign currency to the Maldivian economy after tourism. Correction: An earlier version of this article incorrectly stated that “Mayor ‘Maizan’ Ali Manik” was present at the meeting, instead of ‘Sarangu’ Adam Manik who was Mayor at the time. Ali Manik was absent from the meeting. Minivan News apologises for any confusion caused.